Bacteria, fungi and algae produce valuable substances from simple base materials. They can manufacture environmentally friendly plastics and break down metals. Bacteria are life forms that combine characteristics of the animal and plant worlds. They were the first living cells on our planet and have been colonizing the Earth for over three billion years. Over the course of evolution, bacteria have had ample time to develop a huge range of properties. They can be found everywhere, even in places where life can otherwise barely exist: sulfur springs, volcanic crevices, boiling water, oily rocks, in glacial ice, and in the eternal abyss of the deep sea. Microbiologists suspect there are around 500’000 types of bacteria, but so far only a few thousand have been studied in depth. Bacteria and other microbes are not just pathogenic enemies of humans (causing diseases such as tuberculosis, listeriosis, borreliosis, cholera, leprosy and the plague), they are also helpful friends. Click here to see how the Sulzer skid was installed. Global Bioenergies in Leuna, Germany, already uses microbes. They produce bio-fuels or other petrochemical building blocks such as isobutene from renewable resources. Global Bioenergies developed the process and Sulzer was one of the industry partners in this project. 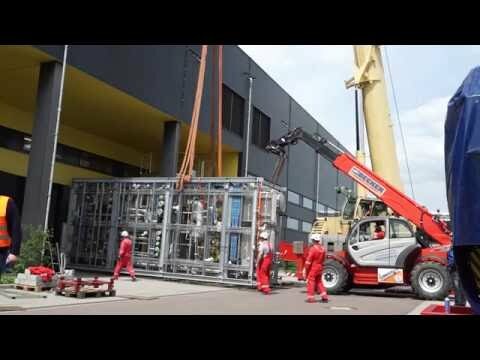 Sulzer Chemtech delivered a special purification skid for the demonstration plant in Leuna. There, isobutene is produced in a bioreactor and leaves as a gas. Sulzer engineers developed a process for collecting and purifing the gaseous product, which can be converted into a biofuel for use in cars. Global Bioenergies is a leader in the development of processes to convert renewable resources into hydrocarbons through fermentation. The focus is in Leuna on the production of isobutene, one of the most important petrochemical building blocks that can be converted into fuels, plastics and elastomers. Fig. 1 Bacteria create the holes in Swiss Emmental cheese without any drilling tools. Some 8’000 years ago, the Babylonians brewed beer using Saccharomyces cerevisiae. Thanks to its ability to convert sugar into carbon dioxide and alcohol, brewer’s yeast became an indispensable helper for beer brewers, winemakers and bakers (who use it to create sourdough). Molds such as Penicillium camemberti and Penicillium roqueforti also transform milk into popular specialty cheeses. Lacto- and bifidobacteria turn milk into yoghurt, thus making it more long-lasting. And propionic acid bacteria create the recognizable holes in Swiss Emmental cheese. Fig. 2 The Sargassum seaweed can store metal in its cell walls. Human ingenuity has produced ever-larger mining machines for drilling, digging and shoveling. The fact that the treasures hidden in the earth’s interior can also be uncovered by tiny, invisible helpers is one of the most fascinating discoveries of the modern age. In 1947, a bacterium that can oxidize sulfur, iron and copper was discovered in the acidic water in coal mines. This bacterium, Thiobacillus ferrooxidans, can convert the sulfides in ore deposits into soluble metallic sulfates, allowing the metal to be extracted from the solution with relative ease. The method has since become very important in the extraction of substandard ore deposits and in generating secondary value from overburden dumps. It is enough to spray the enormous gravel heaps at the mine with acidified water because the bacteria are already there by nature. Microbes that do not just dissolve the metal but firmly deposit it in their cell walls – or even eat it – are also of great interest. The Sargassum natans seaweed can store gold from water containing gold in amounts of up to 40% of its own weight in its cells (Fig. 2). For other microbes, lead, radium and tin are on the menu. This opens up the biotechnical possibility of removing heavy metals from sewage and industrial waste cheaply.